Over the last five years we have successfully designed a low-cost, high-quality toilet, marketed it as aspirational, and built a robust supply chain to make toilets readily available when people were ready to invest. It worked. Now, people are increasingly proud to own a toilet and want the top-of-the-line to show off to friends and neighbours. But a major barrier remains in the market. The top-of-the-line means people want the best structure around their toilet. That leaves them with little option but a brick and concrete shelter, the only option outside of thatch or aluminum. This is an expensive endeavour, costing as much as USD $800 for materials and labour, taking days, sometimes weeks, to construct. Our design team has spent the last year working to solve this challenge and bring a better alternative to the market. 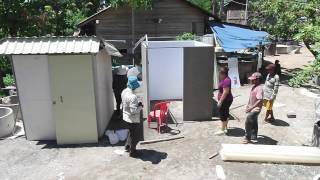 In 2014, our team experimented in the garage of our Phnom Penh office for new ideas. They also collaborated with our local construction business partners to pick the best lightweight materials that would withstand the harshest monsoon seasons and bumpy transport along rural roads. The most promising materials were tested with consumers to ensure the final product would be easy to maintain and looked great. We pride ourselves on human-centered design, a buzzy term that means our customers are at the centre of our decision making process. They are critical in helping us understand what the shelter should ultimately look like and how it should function. How do we make sure the toilet stays clean? How will it stay cool in the afternoon sun? Are parts easily repairable and locally replaceable? The final prototype is a smart functional design that is easy to put together without the need for any tools. No hammers. No drills. Walls snap together with bolts, reducing installation time and labour costs, to less than an hour. For our business partners, the entire shelter stacks to minimize the cost of transport and storage. Now, it’s ready for market testing. Over the last three months we have scoured the region for the best manufacturers, improved every inch of the design and made sure our customers will love it. 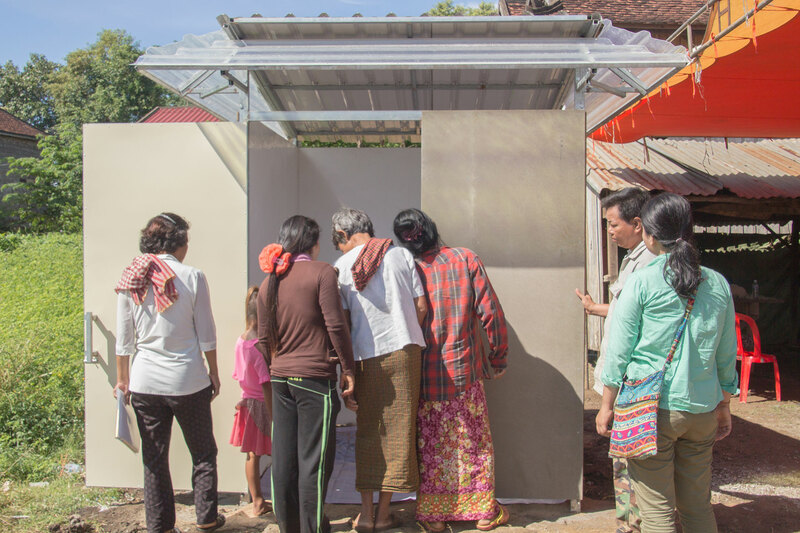 In the new year, we’re taking this shelter to rural communities across Cambodia to finalize the perfect mix of product, price and promotion before we scale it across Cambodia, Southeast Asia and India. Follow us on Facebook, Instagram and Twitter to get the latest on our shelter development and contact us if you’re interested in partnering or getting involved.